Grgo Bravar Limited Liability Company was founded on March 3rd 1996. 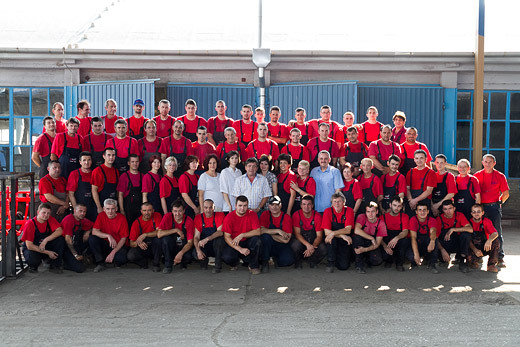 The founder and the owner of the company is Vukmanov S. Grgo, a metal worker for over 30 years who spent 28 years of his working age at Bratstvo Wagon Manufacturing Factory in Subotica. He left the factory as the head of machining department and started a private business. Within a relatively short period of time, his business employing only a few craftsmen grew into a company well known beyond the boundaries of Subotica. The company is located on an area of 15,000 m2 and 5,000 m2 of it is covered with manufacturing workshops and warehouses. In the field of steel constructions and transporting-handling equipment our work includes field assembling services and overhaul of the existing equipment. Among the employees there are 12 certified welding operators for MAG and REL welding. The technological process of production is fully closed - from mechanical preparation of the material to fitting and welding during the assembly and anti-corrosion protection of the assemblies. Anti-corrosion protection includes sand blasting and painting with basic and final coating. When a supreme quality of final coating is required we use our painting and drying chamber, available within the company. GRGO BRAVAR is a reliable and fair business partner providing a high quality of products and services. There is a special working unit within our company for technical inspection, which deals with the technical check of personal vehicles and lorries.